Our mega bus took an additional two hours to arrive in Brussels because of an accident on the highway and a lot of snow. Once in Brussels we found our way to our Airbnb apartment. We paid for a private room in a guy's apartment. After meeting him, we were both rubbed the wrong way, to put in lightly, by his outright racist remarks about Jews. He was Muslim and held very negative and unfounded opinions about Jews. He admitted to us that he had turned down someone on Airbnb because they were Jewish. We were in disbelief. This put us in a very uncomfortable position- we felt that we couldn't say anything because as we were fearful to disagree and make it an uncomfortable and tension filled stay. It was difficult for Scott to bite is tongue, but we were afraid of things getting hostile. It was very upsetting for us to be reminded that such hatred and ignorance exists as we've had the pleasure of primarily interacting with open and like minded travelers. Needless to say, we left the apartment quickly to get away and go see the city...in the rain. We have been in the rain for the last 5 days and it is getting a bit depressing! Definitely not conducive to our walking outside lifestyle. 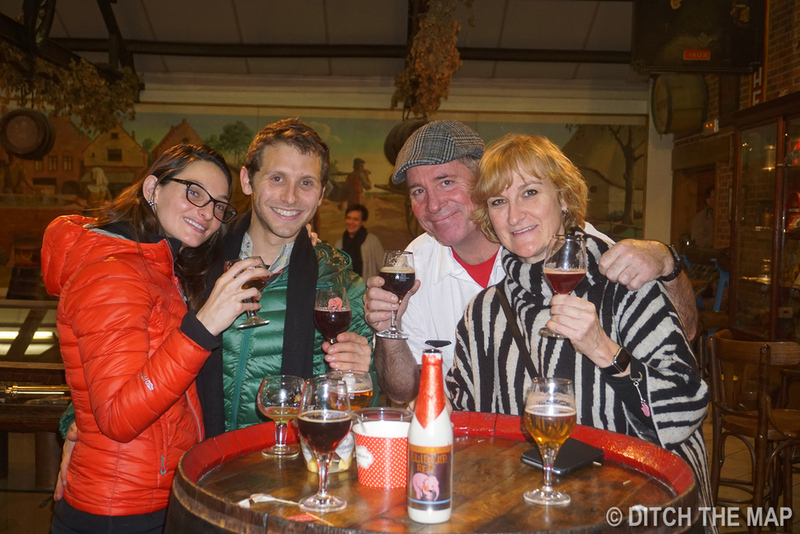 We went to see the Cantillion brewery which brews Lambic beer. We toured the old, small facility and saw where the beer is made, fermented and bottled. This brewery uses a natural fermentation process allowing the yeast and bacteria in the air to innoculate the beer. I learned that gueuze beers are made from a combination of different lambics aged 1,2 and 3 years that then continue to ferment in the bottles. They brewery brews in the winter only because the conditions are better. After our self guided tour we sampled some of their beers- two lambics, a fruit beer, and a gueze beer. As expected, the beers were a bit sour and uncarbonated- interesting flavors, but we weren't crazy about them. We shared a table with a guy from Korea who was traveling Europe before starting his job a nuclear power plant. While sharing our travel plans for Belgium, which essentially involves visiting as many breweries and abbeys as we can, the American guys playing magic cards at table over commended us. They had taken a similar route and made a few suggestions. As cool as we like to think we are, it seems we are not the first to conceive of this brewery tour around Belgium! There were a surprising amount of Americans in the tasting room. After hearing foreign languages for so long, sometimes American English sounds a bit jarring. We finished up at the brewery and walked the cobble stone streets. 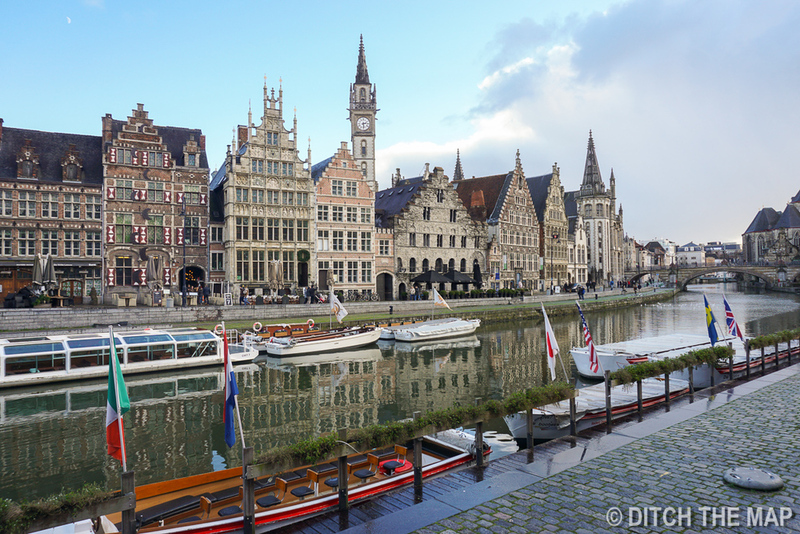 Belgium reminds us of other European towns- they are kind of starting to blend together. 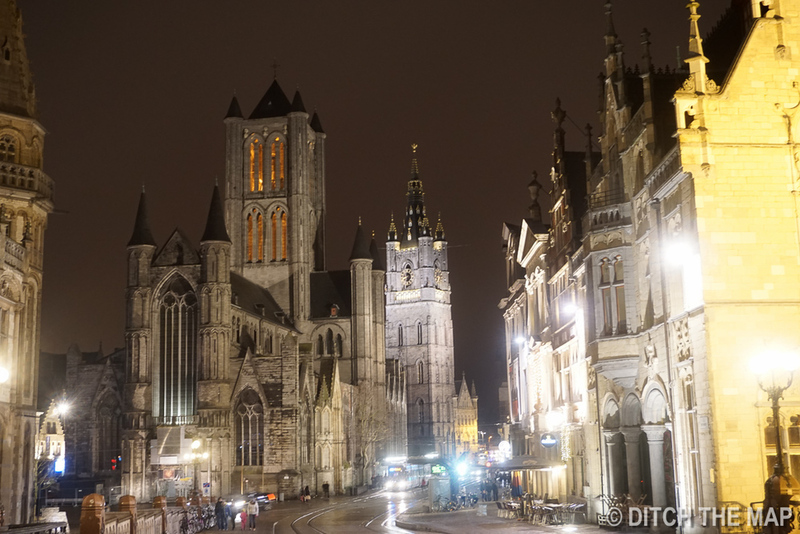 All beautiful and charming but they're similar- cobblestone streets, churches, cathedrals and plazas. We did see a lot of small waffle shops though. We have to try a Belgium waffle soon! 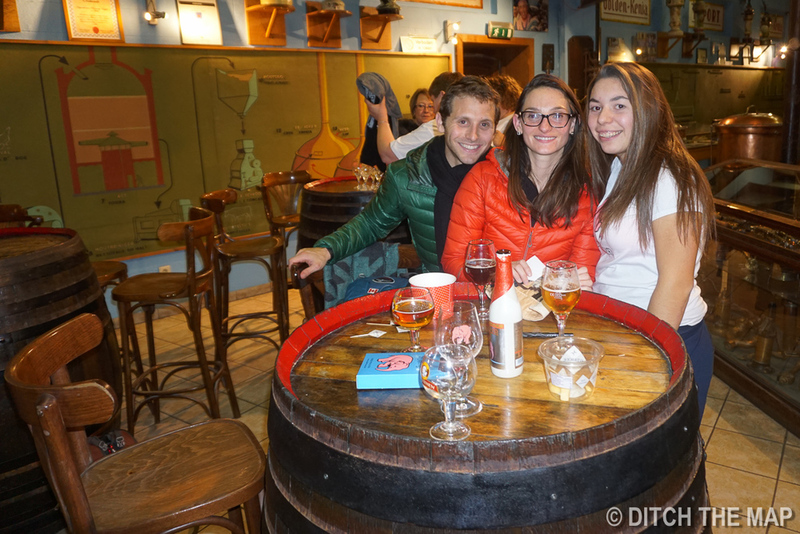 We took a pit stop at a bar to try, what else- more Belgium beer. Scott had a triple and I had a brown beer from an Westmalle, an abbey we are hoping to visit when we are in Antwerp. A friendly guy at the table next to us made some recommendations as to what we should try to get a true Belgium beer experience. After finishing at the bar we found ourselves on a very multicultural street with a vast variety of ethnic food. We had some yummy Thai food. Like Germany, Brussels feels very diverse in its population, with many Arabic people. We tried to say away for the apartment as long as possible, dreading another awkward interaction with our Airbnb host. He was however quite friendly when we returned and told us about his plans to travel the world and the places his lived and traveled. Despite our first impression of him, he turned out to be a relatively nice guy. We can't forget what he said, but I'm glad we have him another chance. He was eager to give us advice. He strongly advised us against traveling to Turkey for safety reasons. We walked the quiet streets in search of breakfast. We noticed serval cats Guarding the windows of a few restaurants and some cats shamelessly splayed across restaurant tables. The place we settled on for coffee has its own adorable kitten who playful pestered us while we researched on our electronics. Cats is restaurants may be a Belgian thing? Our second experience using Bla Bla car was great. A very friendly driver and a very clean car on the short ride to Ghent. 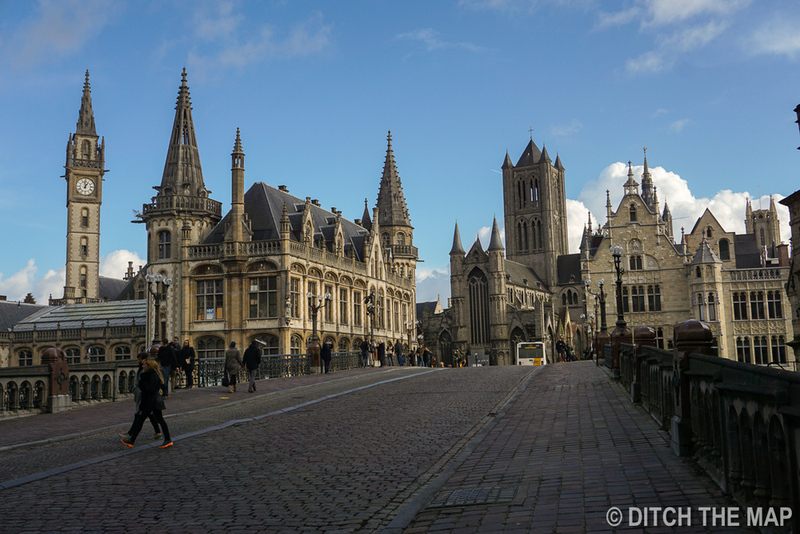 Walking across the bridge into Ghent was like entering a fairytale. We were greeted by beautiful medieval buildings and sunshine! 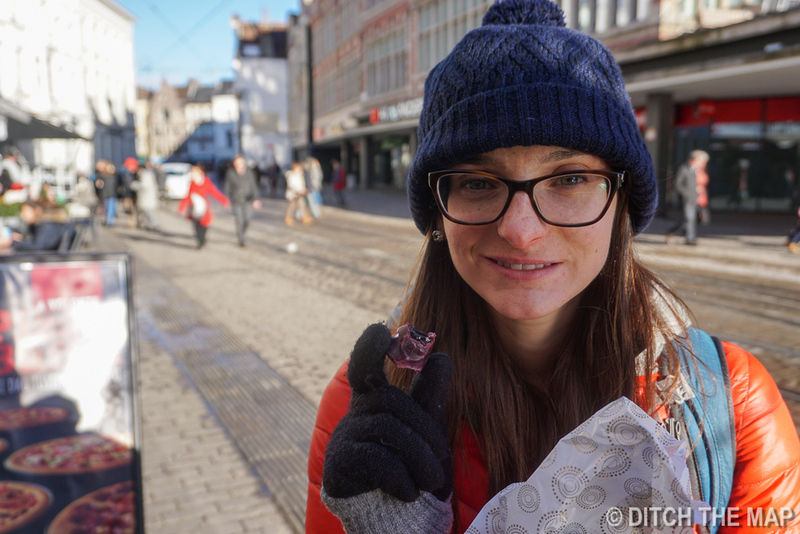 We dropped our bags off at our hostel, as it was still too early to check into our room, and walked around the city a bit. We had a couple hours to kill before our beer tour so we circled the city. Midway we came across a public bathroom—a neat and clean freestanding building with a couple of coed bathrooms…all for free. The look on Sylvie’s face was priceless. The only time I’ve seen her more happy is the time I we discovered that calories don’t count on one’s birthday. She then went on to tell me that she can see herself living here. A city built around Sylvie’s unique inability to hold her bladder for any length of time…a perfect city! Sylvie said that if they had something like that in Philly it would be covered in graffiti, clogged toilets, and no toilet paper. We tried to catch a tram to get to our 4pm pre-arranged beer tour. Tram never came and all public transit in the city seemed to be running very late or not at all. We struggled to find Internet to see what else we could do as the brewery was 45 minutes outside the city. We finally got a connection and took the 1 tram, not knowing if we’d have enough time to make it. The tram came and we got on, but we had no clue how long to stay on it and what to take afterwards. Luckily we guessed correctly and got off at the right stop and walked over to a train/bus station. I was able to get limited Internet again and found out we had one remaining chance to get to our tour on time. Train 2215 dropped us 10 minutes away from where he needed to go. We struggled finding the right train as the display systems were down on the platforms. We got on hoped for the best. Unfortunately there was an usher checking tickets in the coach in front of us. At the first stop he had gotten off and checked to make sure all passengers were on board. When he re-entered the train he got on in the coach after us…we really dodged a bullet. We got off at the second stop and walked briskly to the brewery where they make Delirium Tremens. We sprinted to the unassuming front door of the Huyghe Brewery. We walked through the first floor and found no one. Then we found a spiral staircase outside, and through the first building, and went up it. We passed a brewing room and into another location where we finally found our first employees…just as 4pm struck. We had finally made it on time. We had pre-purchased our ticket and we were the last tour of the day…so we thought! When we inquired about our 4:00 tour we were met with blank stares. Apparently the brewery that we booked the tour was for the following day in Bruges. We’ve been juggling so many cities, breweries, and dates around that we were running around the city desperately trying to make it to our imaginary tour. We were very luck when an older man that worked at the Huyghe brewery offered to show us around on an ‘unofficial’ tour. They were closed for the day for a private event—a women-only brewers convention. The ladies in the main dining hall had paid $150 to participate in a beer-ranking event. The members had come from many different countries. The tour consisted of Sylvie, myself, and an older man who was waiting on his wife during the conference. The brewery was relatively large and the guy had said they were scaling up production massively in recent years. It was interesting to hear his enthusiasm about the larger steel fermenters and the modern cold nano-filtration they were using. The older copper tanks and hot filtering techniques are typical of small production/older brew houses. It seemed as though Huyghe was in the midst of transitioning to a large player in the global beer distribution market. 80% of all their production is exported to 96 countries. The most popular of their beers can readily be spotted in the US— Delirium Tremens. This beer has been voted before as the world’s best beer. I’m happy to say that I’ve tasted 4 beers in my life that have unbiased claims of being the ‘best beer in the world’. After our tour we rejoiced in sampling 2 different types of beers that they had on tap. They had the extremely rare ‘Deliria’ on tap, which is a very limited production run beer. It is, in fact, a beer brewed exclusively by women for this particular annual women brewer’s event. We chatted with the other guy on the tour along with the older gentleman who had just given us the tour. As we finished our beers we were given more. We talked about Vietnam, a country that both of them had been to, along with other places. They asked where else we were planning on traveling and we told them. I’m beginning to learn not to answer this particular question any more. More times than I’d like to count they person responds by saying something like, “oh, no! You don’t want to go there. It’s too dangerous to go there”. These people, although not always, tend to be of the less traveled variety. I’ve had people tell me not to go to Sau Paulo, or Bogota, and that Buenos Aires is extremely dangerous. We felt 100% safe in all these places. It’s very apparent that people have trouble understanding what risk is. Many people seem to confuse likeliness with the inability to protect oneself. For example the chance of being involved in a car accident is much higher than dying in a ‘terrorist’ attack. However people will oftentimes dismiss the risk of car accidents because they feel that they have more control and can somehow ‘lower’ their likelihood of becoming a victim. Since victims of terror attacks have no control the perceived danger is much higher than the probability supports. The worry about terrorism is getting so annoying! It’s here, it’s always been here, and it’s not going anywhere. We need to get used to it. Let’s focus our fears on reforming gun laws. American gun violence is something that is more statistically likely than a terror-related incident. On our way back to our hostel we got caught not paying for the ticket on the train and had to pay a 15-euro penalty, onto of the 5-euro ticket fee. Even though we were in bed by 11 we both slept horribly. People were coming in from 2 until just before 5am. Some of the guys were coughing so loudly that they woke up the entire room of us. There were 15 beds and mostly all of them were occupied. A couple drunken assholes yelled, “good night fellow” as he climbed into bed at 4:45. It was a horrible night of sleep. We slept in and enjoyed our first free breakfast in a long while. Even though it was just bread and jam it was a nice surprise. We went to the castle where they had a room of old weapons and another room of old torture tools. 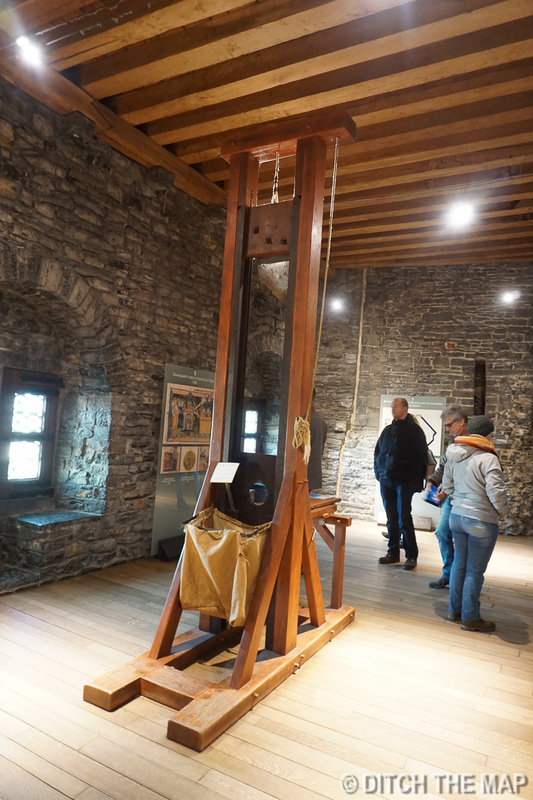 They even had an original guillotine. The castle was kind of cool, but at 10 euros apiece it was extremely overpriced. Afterwards we walked to a particular square in town where two candy vendors are known to have a long history of competition. They each sell Cuberdons, which is a cone-shaped Belgian candy. We tried a few of various flavors…they were good. We took a train directly to Bruges which only took 25 minutes.